We are at the finish of the Bekoji 100 Relay, a running event that started 100 miles and 13.5 hours ago at the edge of Bale Mountains National Park southeast of here. Over the course of that distance and time, 48 people–a combination of Girls Gotta Run team members, female Ethiopian Athletics Federation team members, and visitors from several Western countries–ran five-kilometer, paved-road increments, passing the proverbial baton from runner to runner until we connected the start- and finish-line dots. How can 13.5 hours seem at the same time like a lifetime and no time? So much has happened that the starting line feels a world away, now separated from us by so many stories. Yet the day is also such a blur that the only explanation is an immediate, rocket-ship journey. 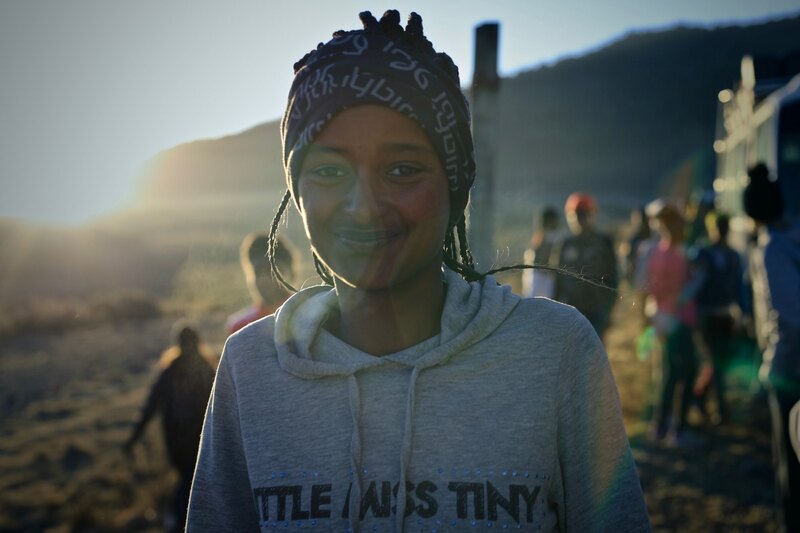 The Bekoji 100 Relay is the brainchild of Girls Gotta Run, and its goals are many. 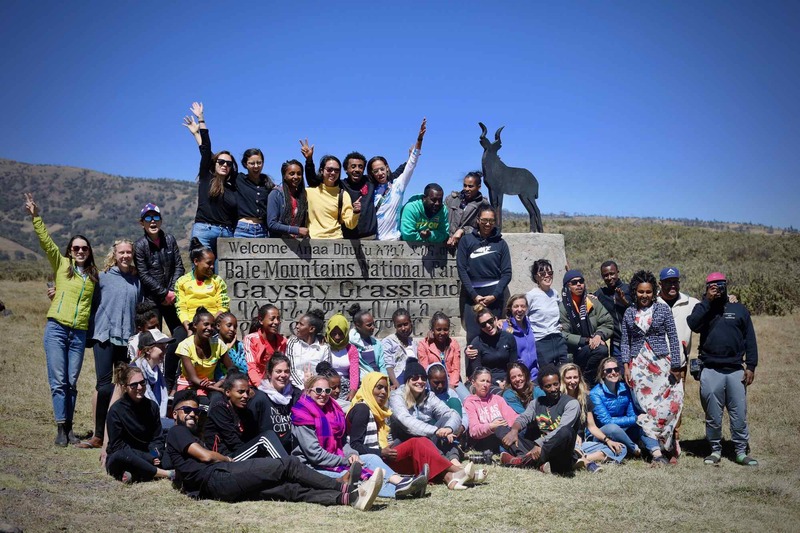 The nonprofit wanted to create a fun, new experience for its team members, and traveling 100 miles away from home to run is certainly an adventure for a teenage girl from Bekoji. Second, Girls Gotta Run wants to provide opportunities for ‘faranji,’ foreigners in Amharic, to connect with and learn about the Girls Gotta Run team. They also want to carry a message of peace through the region. A Girls Gotta Run team member at the Bekoji 100 Relay’s sunrise start. 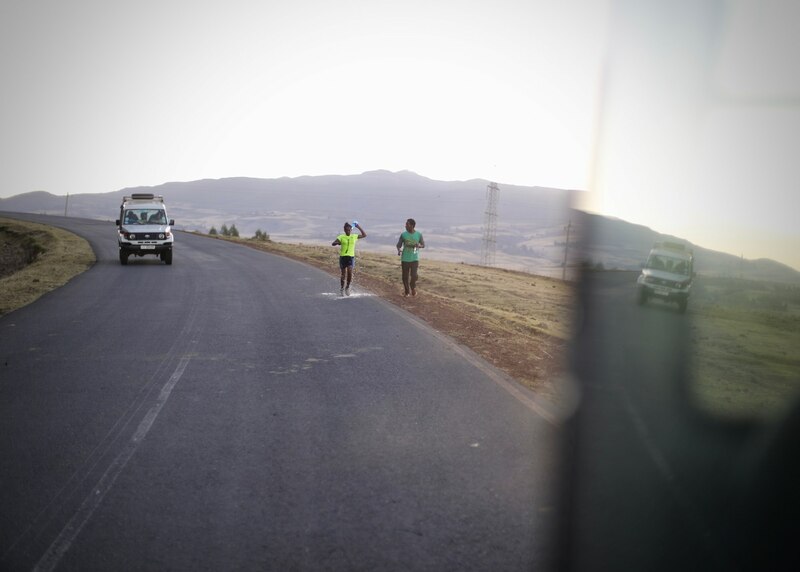 We’ve crossed the Bale Mountains, running up above 11,700 feet altitude to do so. Several girls put down 16-minute 5ks despite hills, heat, altitude, and traffic. We talked with locals in the towns and villages through which we passed who were so curious and excited about our event that they ran with us for a few yards or more. We danced; oh how we’ve danced! We ran while chatting, and sometimes in silence. Some ran in groups while others went it alone. Some raced; some moseyed. We tolerated the morning chill and the afternoon heat, a normal temperature swing for these high altitudes so close to the equator. We donned headlamps and safety vests and carried glow sticks when the sun set. 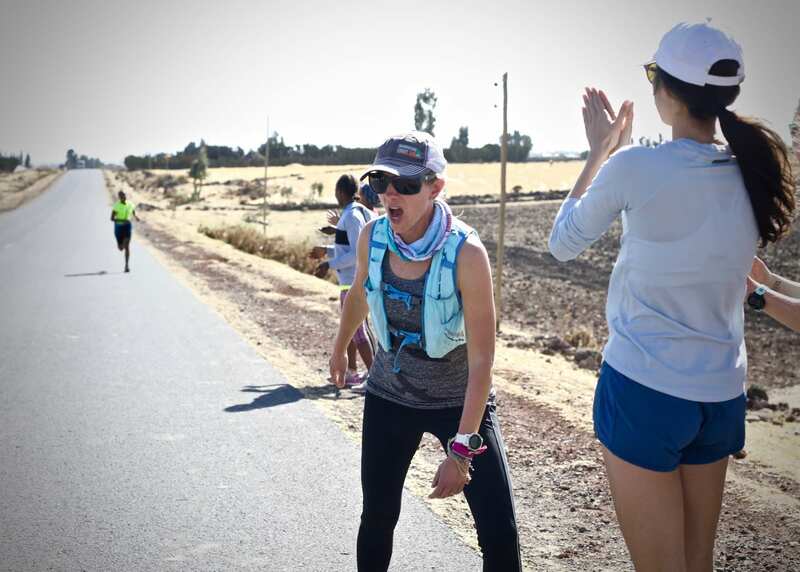 And now we rage–and I mean rage–back into Bekoji, our relay runner looking like she’s racing 800 meters instead of 5,000, many of us desperately chasing her but all of us getting dropped, our support busses picking up the stragglers as they follow behind, until we reach the finish line. We pile off the busses and become a blur of girls, women, and a few men. We sing, smile, clap, join arms, and jump in a big circle on the side of the road. It’s the middle of the evening in the middle of town, and our fray captures the attention of dozens of people who are out and about. They crowd around to watch, some starting to sing and clap too. A relay handoff about to go down. We’d all gather and jump and cheer and just about freak out for each of these handoffs. I can hardly think because of all the feeling, all the energy passing among us. It’s almost a little too much. In this case, though, a little too much is actually just right, and somehow it feels perfect to be right here, in the middle of rural Ethiopia on a random Thursday night, linking hands and leaping around with a group of girls and women who were strangers three days ago and who are now your friends, all because you relayed 100 miles together and rallied around your shared mission. Yeah, I mean, it’s an impossibly illogical scenario, but it makes all the emotional sense in the world. Do you feel me? While much of the relay was high energy, there were some contemplative moments. 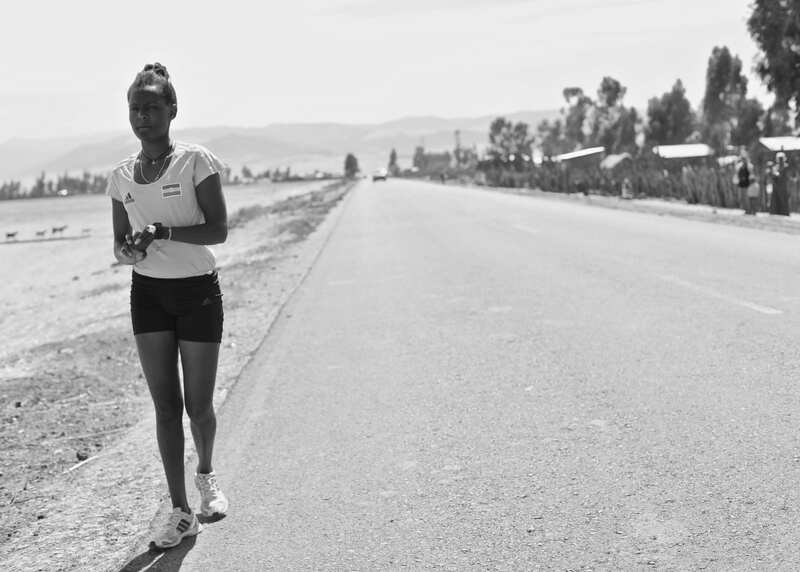 An Ethiopian Athletics Federation team member takes a quiet moment before her relay leg. Even after the sun set, the temperatures were still warm enough for a mid-leg dousing. Meghan, this is a fantastic series! Every single one of these dispatches is fascinating. Thank you for your commitment to telling this story in such an honest, colorful way. Excellent journalism!